In the part 1 and part 2 of the blog series, I show the examples to create compress tables using CREATE TABLE and ALTER TABLE MOVE. For small tables in the example, it might be ok not to use the parallelism. But for big tables, parallelism is highly recommended just like the photos above. 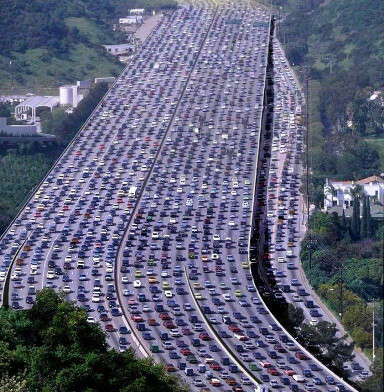 You have to have many lines on highway to allow high throughput. I wish adding a new line on highway could be as easy as change DOP in SQL. This post discusses parallelism for the compression methods. As the command will be similar for different kinds of compression method, I pick one HCC method and test the timing for different DOP values. As QUERY LOW gives a lower compression ratio and is very unlikely I am going to use in production, so QUERY LOW is out. Let’s look at ARCHIVE HIGH, although it can give a much better compression ratio, the processing time is usually several times longer than other HCC methods. Given it could also take a longer time to uncompress the data when we need to move data to non-Exadata environment, I will be very unlikely to use this method in the production unless I really need to save significant amount space. So it leaves with QUERY HIGH and ARCHIVE LOW. Both of them are using ZLIB (gzip) compression algorithm. The timing and compression ratios seem quite close from my experience. So either one of them is fine for my test and I choose QUERY HIGH compression method as the base for our test. I also increase the size of the test table to 80 million rows. It seems I need to do the commit first before I can do further insert operation. Let’s find out what is the size for this table. Then create three more similar tables. As the DOP increases, the processing time reduces in a linear fashion. The compression time for a 9G table reduces from three and half minutes to less than half minute with DOP of 8. Another interesting part is that the final compression size is slight different with different DOP value. Many times I need to check out the network traffic on Exadata. 12c OEM Cloud Control is good way to monitor system performance on Exadata. However, sometime I need something quick and want to see the network traffic result from command line. Here are the commands I usually use to check out network traffic for ethernet network and infiniband network. The first command is dstat. Here is the result I run from our X3 box. If add three options lms, it will also shows load, memory usage and swap usage. In the previous post, iDB vs RDS vs SDP on Exadata, I discussed high level overview about these three different concepts used in Oracle Exadata and related Oracle Engineered Systems. I will show a few more useful commands to illustrate these protocols. The first command I would like to talk about is ibhost. 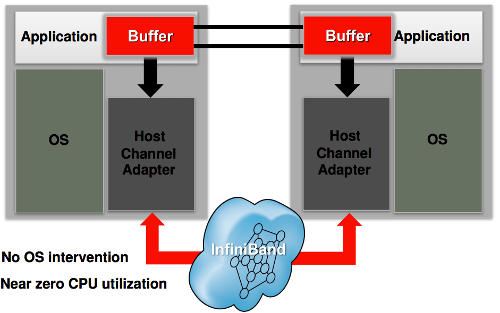 This InfiniBand command discovers the InfiniBand fabric topology or uses the existing topology file to extract the channel adapter nodes. The followings is the output from our x3 1/8 rack Exadata. Ca	: 0x0010e00b4e20c000 ports 2 "SUN IB QDR GW switch enkbda1sw-ib2 192.168.8.150 Bridge 0"
Ca	: 0x0010e00b4e20c040 ports 2 "SUN IB QDR GW switch enkbda1sw-ib2 192.168.8.150 Bridge 1"
Ca	: 0x0021280001efdf70 ports 2 "enkbda1node10 BDA 192.168.12.110 HCA-1"
Ca	: 0x0021280001efd5ee ports 2 "enkbda1node09 BDA 192.168.12.109 HCA-1"
Ca	: 0x0021280001efd4ea ports 2 "enkbda1node12 BDA 192.168.12.112 HCA-1"
Ca	: 0x0021280001efd4d6 ports 2 "enkbda1node11 BDA 192.168.12.111 HCA-1"
Ca	: 0x0021280001efd5f6 ports 2 "enkbda1node14 BDA 192.168.12.114 HCA-1"
Ca	: 0x0021280001efd4e6 ports 2 "enkbda1node13 BDA 192.168.12.113 HCA-1"
Ca	: 0x0021280001ceda62 ports 2 "enkbda1node16 BDA 192.168.12.116 HCA-1"
Ca	: 0x0021280001cf5abe ports 2 "enkbda1node15 BDA 192.168.12.115 HCA-1"
Ca	: 0x0021280001efac6a ports 2 "enkbda1node18 BDA 192.168.12.118 HCA-1"
Ca	: 0x0021280001efd4fa ports 2 "enkbda1node17 BDA 192.168.12.117 HCA-1"
Ca	: 0x0021280001efdf68 ports 2 "enkbda1node08 BDA 192.168.12.108 HCA-1"
Ca	: 0x0021280001efd5e6 ports 2 "enkbda1node07 BDA 192.168.12.107 HCA-1"
Ca	: 0x0021280001efd606 ports 2 "enkbda1node05 BDA 192.168.12.105 HCA-1"
Ca	: 0x0021280001efd4ee ports 2 "enkbda1node06 BDA 192.168.12.106 HCA-1"
Ca	: 0x0021280001efd616 ports 2 "enkbda1node03 BDA 192.168.12.103 HCA-1"
Ca	: 0x0021280001efdf98 ports 2 "enkbda1node04 BDA 192.168.12.104 HCA-1"
Ca	: 0x0021280001efd84e ports 2 "enkbda1node01 BDA 192.168.12.101 HCA-1"
Ca	: 0x0021280001efdf6c ports 2 "enkbda1node02 BDA 192.168.12.102 HCA-1"
Ca	: 0x0010e00b88c0c000 ports 2 "SUN IB QDR GW switch enkbda1sw-ib3 192.168.8.151 Bridge 0"
Ca	: 0x0010e00b88c0c040 ports 2 "SUN IB QDR GW switch enkbda1sw-ib3 192.168.8.151 Bridge 1"
Ca	: 0x0021280001fcb9ec ports 2 "enkalytics EL-C 192.168.12.131 HCA-1"
Ca	: 0x0021280001fc4a1e ports 2 "enkx3db02 S 192.168.12.2 HCA-1"
Ca	: 0x0021280001fcbf5c ports 2 "enkx3cel03 C 192.168.12.5 HCA-1"
Ca	: 0x0021280001fbe18e ports 2 "enkx3cel01 C 192.168.12.3 HCA-1"
Ca	: 0x0021280001fc80c6 ports 2 "enkx3cel02 C 192.168.12.4 HCA-1"
Ca	: 0x0010e0000128ce64 ports 2 "enkx3db01 S 192.168.12.1 HCA-1"
For a 1/8 rack, it has 2 database nodes, 3 cell nodes and 2 IB switches. You might notice we have many more nodes than supposed to be on the InfiniBand fabric. From the naming, you might figure out we have our X3 Exadata, Oracle Big Data Appliance, and Oracle Exlatics connected together all within the same InfiniBand network. In TCP/IP network, we use ping command to verify whether a host can be accessed or not. Similarly, in InfiniBand network, we use rds-ping command to ping another IB node in the network. The following example shows we could do rds-ping from Exlatics node to the ibvip on the first database node. Another useful rds related command is rds-info. To save space, I removed some smiliar messages. If you want to test the throughput between two IB nodes, you could use rds-stress. First, start rds-stress on the target node. Then, run the following command on source IB node. After it starts on the source node, the target node will also show the progress. After press CTRL-C on source node, the result average is printed out on target node. Finally, let’s talk about SDP. My colleague, Andy Colvin, has setup a SDP listener on our X3 Exadata. Here are the command showing Oracle listens on the SDP port. Service "DBM_ETL" has 1 instance(s). Service "DBM_REPORTING" has 1 instance(s). Service "dbm" has 1 instance(s). Like netstat command to check out TCP connections, there is corresponding command, sdpnetstat, for SDP connections. Unfortunately, by default, this command does not exist on Exadata for now, but it does exist on Oracle Big Data Appliance or Oracle Exlatics. Here is one example of the output from Exlatics. If you have done work on Exadata, you probably hear many buzz words, like Storage Index, Smart Scan, Offloading, and etc. Many of these features are based on InfiniBand Architecture, which is high-speed interconnect architecture with high throughput and low latency. 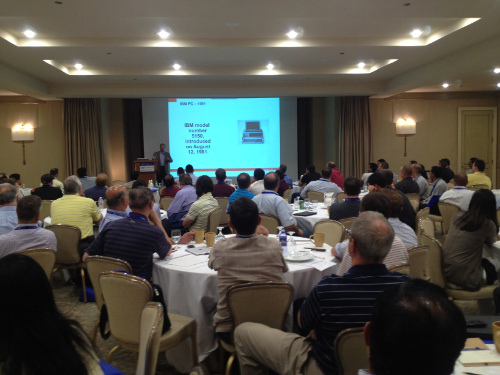 Talking about InfiniBand, many of us know iDB and RDS on Exadata. But not many people know about SDP. In this post, I discuss more in detail about among iDB, RDS and SDP. Oracle Exadata uses the Intelligent Database protocol (iDB) to transfer data between Database Node and Storage Cell Node. It is implemented in the database kernel and work as funtion shipping architecture to transparently maps database operations to Exadata operations. iDB can be used to transfer SQL operation from Database Node to Cell node, and get query result back or full data blocks back from Cell Node. iDB is built on Reliable Datagram Sockets (RDS v3) protocol and runs over InfiniBand ZDP (Zero-loss Zero-copy Datagram Protocol). The objective of ZDP is to eliminate unnessary copying of blocks. 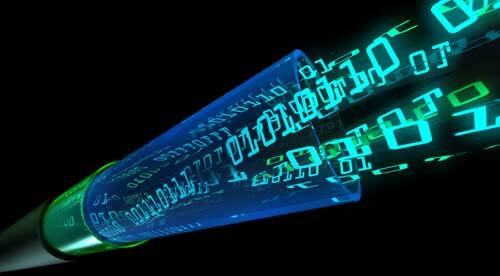 RDS is based on Socket API with low overhead, low latency, high bandwidth. Exadata Cell Node can send/receive large transfer using Remote Direct Memory Access (RDMA). RDMA is a direct memory access from the memory of one computer into another computer without involving either’s operating system. The transfer require no work to be done by CPUs, caches, or context switches, and transfers continue in parallel with other system operations. It is quite useful in massively parallel processing environment. RDS is highly used on Oracle Exadata. RDS can deliver high available and low overhead of datagrams, which is like UDP but more reliable and zero copy. 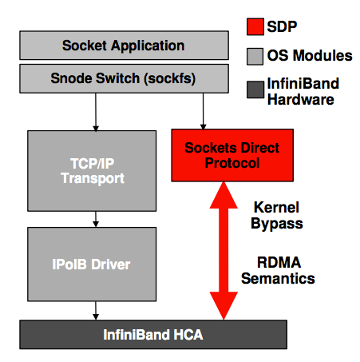 It accesses to InfiniBand via the Socket API. RDS v3 supports both RDMA read and write and can allow large data transfer up to 8MB. It also supports the control messages for asynchronous operation for submit and completion notifications. If you want to optimize communications between Oracle Engineered System, like Exadata, Big Data Appliance, and Exlatics, you can use Sockets Direct Protocol (SDP) networking protocol. SDP only deals with stream sockets. SDP allows high-performance zero-copy data transfers via RDMA network fabrics and uses a standard wire protocol over an RDMA fabric to support stream sockets (SOCK_STREAM). The goal of SDP is to provide an RDMA-accelerated alternative to the TCP protocol on IP, at the same time transparent to the application. It bypasses the OS resident TCP stack for stream connections between any endpoints on the RDMA fabric. All other socket types (such as datagram, raw, packet, etc.) are supported by the IP stack and operate over standard IP interfaces (i.e., IPoIB on InfiniBand fabrics). The IP stack has no dependency on the SDP stack; however, the SDP stack depends on IP drivers for local IP assignments and for IP address resolution for endpoint identifications. 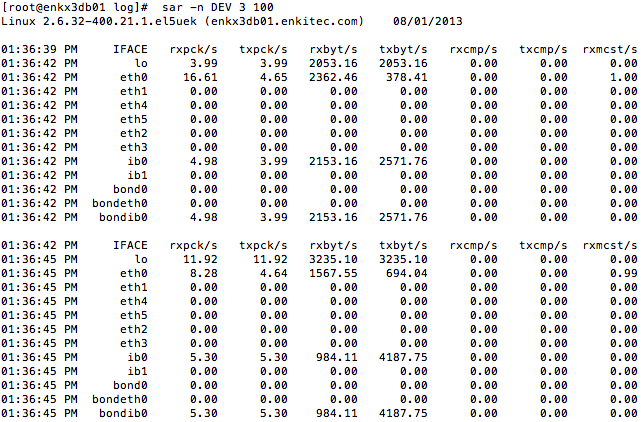 In a future post, I will discuss about some commands useful to check out Infiniband traffic, RDS and SDP. In the post of Part 1, I show the default port numbers for general purpose. The Part 2 shows the port numbers related to ILOM. 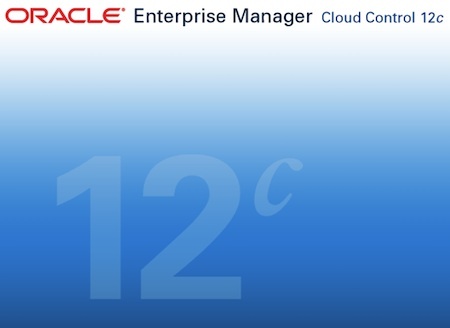 This post shows the port numbers for 12c Oracle Enterprise Manager (OEM) Cloud Control. Check means check the port number configured in the installation. There are a few ports not necessarily through the firewall between Exadata and OEM OMS. There are also some more ports related to OEM and optional, and only need when using the components. It is outgoing from OMS and used for communication with Oracle for OCM, MOS, Patching, Self-Updates, ASR. I could not find a command to show what’s port number is used for something like Node Manager, Managed Server. But do find a way to show this kind of information from a temp file in the initial installation. The file is in MIDDLEWARE_HOME/.gcinstall_temp/staticports.ini on OMS host. 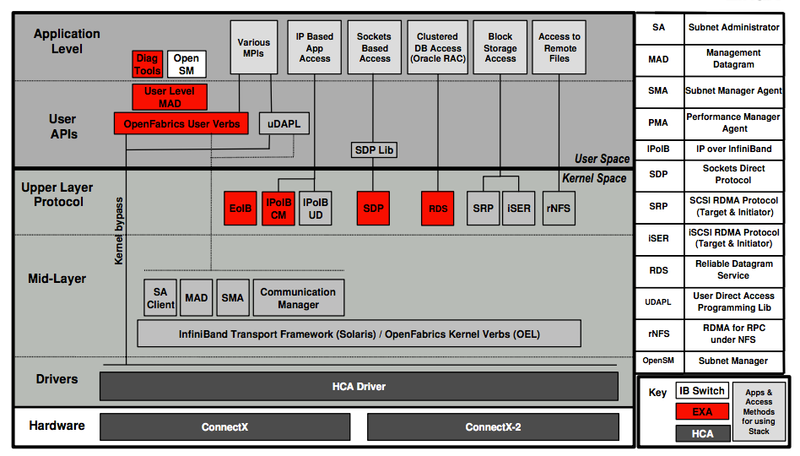 The following chart shows firewall configurations for OEM components.